Dave Kenny’s family is steeped in Easter Rising history. Here he recalls finding a letter from the Eamonn Ceannt’s son, revealing how he lived his life in his father’s shadow. From the Examiner. My mother was watching us from the sink, through the steam rising from her potato pot: “Come in for your tea and bring my good blue tray with you.” Her “good blue tray” had been discarded and was leaning against the blackened anthracite bunker. It was bearing up remarkably well, considering it had spent the morning being used as a sleigh. It was a great tray, bought as a wedding present in Switzer’s by a friend of my father’s family: the Walkers. A man named Ronan. He was a “sad figure”, my mother said. You may think it odd to start an article about 1916 with a description of a tray. It makes perfect sense to me. I grew up surrounded by 1916 memorabilia. Not holsters or bayonets, but ‘minutiae’: buttons, photographs, books. A blue tray. History exists in both the heroic and the mundane. My dad’s family were steeped in 1916. My great-grandad, Matthew Walker, published the Irish War News for Pearse and delivered his farewell letter to his mother. My Abbey actress grandmother (‘Gipsy Kenny’) carried dispatches for Charlie Burgess -- you know him as Cathal Brugha. My grandaunt, Maire nic Shiubhlaigh, led Cumann na mBan at Jacob’s during the Rising. Seven years ago, I was rustling through grandaunt Maire’s papers when a letter fluttered to the floor. It was from a man who had lost his mother. It was signed, simply, ‘Ronan’. I had an inkling who he might be so I searched my father’s books and took down Piaras F Mac Lochlainn’s Last Words: Letters and Statements of the leaders executed after the Rising at Easter 1916. I found the entry I was looking for and returned to the letter. I saw a 10-year-old boy holding a watch chain outside Kilmainham Gaol. The boy is Eamonn Ceannt’s son, Ronan. He is the man who gave us the blue tray. His mother is Aine Ceannt. My grandaunt Maire had spent the day before the Rising at their house. The tragically modest tone of Ronan’s letter gives the impression of a man who feels that life has passed him by: “Maire, from time to time, for years past, I have wondered if mamy [sic] was, in a way, disappointed in me for not having shown myself to have been as fine a man as my father was. I never had the courage to ask mamy and she never gave me any special reason for my idea, but, yet, she may, deep down, have felt I was a bit of a failure. I’d rather know the answer to that question than be kept in ignorance, so if mamy ever spoke of the matter, will you please tell me what she said, even if it’s hard to hear? Please remember, I’m not just looking for words of praise and suchlike but just to be told the truth. Whilst I haven’t exactly got an ‘inferiority complex’, at the same time I have no great sense of my own importance and it won’t do me any harm to know the truth. “Mamy loved my father until death parted them and, until she died, she loved and honoured his memory and felt hurt when he appeared to be forgotten by those who owed him, equally with his companions, the freedom and good life which 1916 ushered in. An hour later, he is blindfolded and put sitting on a soap box before being executed. His son’s letter shows the tragic effect the executions of the 1916 leaders had on their families. Aine became an anti-Treaty ‘diehard’ during the Civil War, and suffered for it. Ronan suffered too. Try to imagine being 10, knowing that your father is about to be shot. Try to imagine then living in the shadow of a colossus you could never hope to emulate. 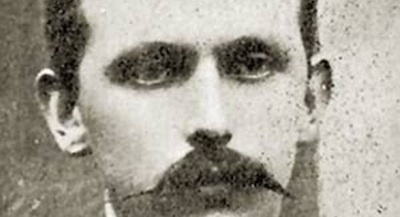 Ceannt’s death was no sterile ‘blood sacrifice’. It was a tragedy for his family. He was a man, not an icon. He was one of us. 1916 is not just a dusty chapter in a schoolbook. It’s so close, we can still touch it. Ronan fulfilled his father’s wishes. He never married. He looked after his mother until her death. He never realised it but he, too, was a hero. He gave up his own life for the care of another. Eamonn and Ronan Ceannt showed that ordinary people are capable of extraordinary selflessness. That’s the true legacy of 1916. Revolutions are fought by ordinary people hoping to build an ordinary world. Our Ireland needs heroes. We can draw on the memory of their courage to rebuild our country, post-Troika. We’re still the same race that produced men like Eamonn Ceannt. 1916 is only a fingernail’s breath away. It’s in the mundane. It’s in an old letter. Or a tray skittering down a snow-clad garden. It’s in all of us.